A miniature atom-based magnetic sensor developed by the National Institute of Standards and Technology (NIST) that operates at room temperature has set a new record in miniaturization of magnetic measurements of the brain. The measurements were verified by comparing them with signals recorded by a SQUID (superconducting quantum interference device). SQUIDs are the world’s most sensitive commercially available magnetometers for biomedical applications such as studying mental processes and advancing the understanding of neurological diseases. NIST and German scientists used the NIST sensor to measure alpha waves in the brain associated with a person opening and closing their eyes as well as signals resulting from stimulation of the hand. The NIST mini-sensor is slightly less sensitive than a SQUID now but has the potential for comparable performance while offering potential advantages in size, portability and cost. It consists of a container of about 100 billion rubidium atoms in a gas, a low-power infrared laser and fiber optics for detecting the light signals that register magnetic field strength — the atoms absorb more light as the magnetic field increases. 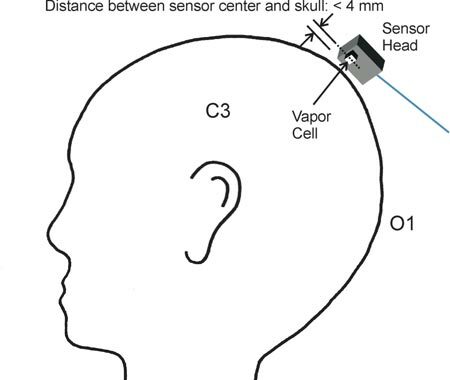 The study results indicate the NIST mini-sensor may be useful in magnetoencephalography (MEG), a noninvasive procedure that measures the magnetic fields produced by electrical activity in the brain. MEG is used for basic research on perceptual and cognitive processes in healthy subjects as well as screening of visual perception in newborns and mapping brain activity prior to surgery to remove tumors or treat epilepsy. MEG also might be useful in brain-computer interfaces. MEG currently relies on SQUID arrays mounted in heavy flasks containing cryogenic coolants because SQUIDs work best at 4 degrees above absolute zero, or minus 269 degrees Celsius. 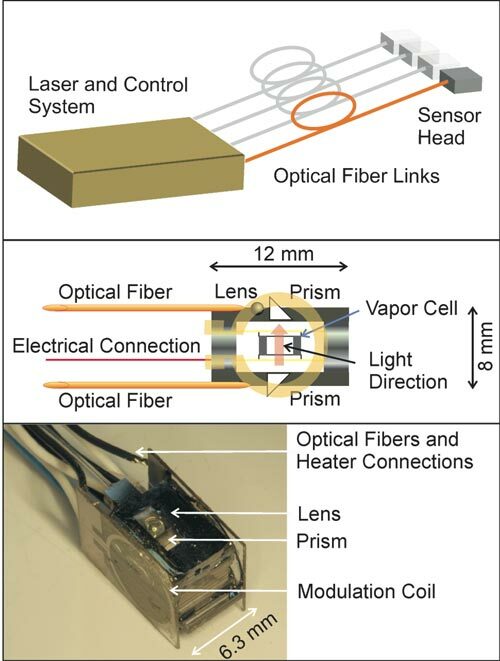 In contrast, the chip-scale NIST sensor is about the size of a sugar cube and operates at room temperature, so it might enable lightweight and flexible MEG helmets. It also would be less expensive to mass produce than typical atomic magnetometers, which are larger and more difficult to fabricate and assemble. The sensor has been improved since it was used to measure human heart activity in 2010. NIST scientists redesigned the heaters that vaporize the atoms and switched to a different type of optical fiber to enhance signal clarity. The brain experiments were carried out in a magnetically shielded facility at the Physikalisch Technische Bundesanstalt (PTB) in Berlin, Germany, which has an ongoing program in biomagnetic imaging using human subjects. The NIST sensor measured magnetic signals of about 1 picotesla (trillionths of a tesla). For comparison, the Earth’s magnetic field is 50 million times stronger (at 50 millionths of a tesla). 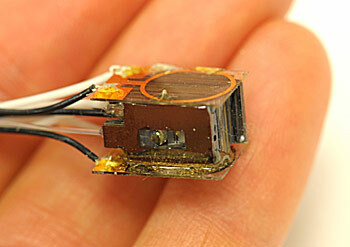 NIST scientists expect to boost the mini-sensor’s performance about tenfold by increasing the amount of light detected. Calculations suggest an enhanced sensor could match the sensitivity of SQUIDS. NIST scientists are also working on a preliminary multi-sensor magnetic imaging system prior to testing clinically relevant applications.